Englsih Gardens Landscape Design in Santa Barbara and Ventura | Down to Earth Landscaping Inc.
Down to Earth Landscaping Inc.
them. English gardens often have a practical, country feel that is intentionally unmanicured in their design. We love to use them because of their natural feeling and “wild” nature. However, the English garden design, is much more involved than many might expect. The formal English garden style might be considered a British response to the “perfectly” composed garden on the European continent. Formal gardens on the continent are exacting in the application of their style. In other words, they require plants to be placed in meticulous order for an artistic effect. The style, much like the perfectly displayed plate of French cuisine, is intended to be a statement of design, sophistication and beauty. By contrast, the English garden style, of which dates back to the eighteenth century, represents an idealized view of nature. A view common to the British romantic philosophy of the eighteenth and nineteenth centuries. The English park was still influenced by the European continental style, but their response was a design that aligned the European formal garden with a pastoral country style. The country style has always been a matter of pride amongst the British. During the romantic period, a look of a “working farm” was popular with the aristocracy. Though this aristocracy may not have wanted to do the farm work associated with the pastoral garden, they nevertheless prized the work of the “country folk” who did. It is funny that the look of the traditional English garden that the upper class commissioned was actually the natural state of the practical or working gardens commonly found in the “country”. A working English garden differs from a formal garden if for no other reason than it is “working.” It provides food for the humans and animals that live on it. In fact, the “look” of the British garden style brings together the best of both garden styles. When the style moved to Ireland, many of the colonizing English took the best of the local Irish flora and incorporated it into their estates. An Irish park such as Powerscourt in County Wicklow is an exquisite example of the relationship between the influence of the formal continental garden and the “uncultivated” British country garden. This style moved beyond the larger manor houses. It became a cultural design standard and embraced abroad. As similar as the various styles of British gardens may be, there is a central difference between the English garden and the Irish garden versions. While English gardens incorporate the pastoral into the formal, Irish gardens incorporate the formal into the pastoral. Irish gardens emphasize asymmetrical lines and informal planting style while still maintaining a certain level of formality. The designers of Irish place a premium on relaxation in the garden, and are deeply influence by the Irish love of their own landscape. It is that relaxed style that we like to incorporate into our English and Irish gardens. 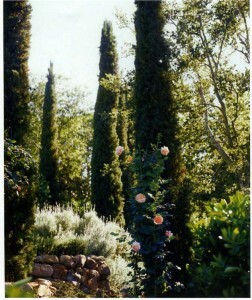 We’d love to chat about how to create English gardens in Santa Barbara. Or send us a picture of your English garden. Down To Earth Landscapes Inc. Copyright © 20ll Down to Earth Landscapes Inc.